Board certified in dermatology, Dr. Kellie Mosley-Mendez earned her medical degree from Nova Southeastern University School of Osteopathic Medicine in Ft. Lauderdale, Florida, where she was recognized as Osteopathic Medical Student of the Year and awarded the Russell C. McCaughan Educational Scholarship Award. 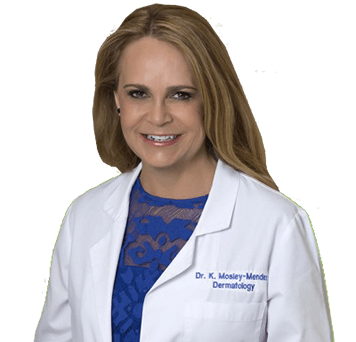 Dr. Mosley-Mendez completed her residency in dermatology and cutaneous surgery at Broward General Medical Center/Nova Southeastern University in Ft. Lauderdale. She has been practicing dermatology in Florida since 2002 both in Miami and Fort Lauderdale, Florida. Originally from by Vidalia, Georgia, Dr. Mosley-Mendez resides with her husband Kevin and son Kevin Jr. She enjoys traveling and boating and is very proud of her son Kevin Jr., who is on the USA Junior Olympic diving team.